Valuable practical exercises in queen rearing techniques. Study Group workshop in preparation for the November examinations. Worcester Beekeepers - Home-Grown Gold! Regular meetings at our training apiary. BBKA 'Basic' Assessment Prep Sessions underway! New clues to the decline of bees and other pollinators. An interesting article about how the other pollinators, as well as bees, are in decline. There are 25,000 known species of bee of which 250 different species live in the UK. 90% of the bees that reside in the UK are classed as solitary bees. The queen bee is unable to care for herself. She is tended to by other bees that follow, groom and feed her, and even carry away her waste. The queen’s sole role in the colony is to lay eggs, at her peak she can lay up to 2,000 per day. She can live for one to three years. Worker honeybees live four to six weeks during the peak season. Number of days from egg to emerging bee: queen 16, worker 21 and drone 24. A honey bee will die once it has stung. The bee’s stinger which carries barbs hook into its victim and is ripped out of the bee along with the poison sac – the bee then hemorrhages to death. Honey bees communicate with each other by performing a waggle dance. This dance tells the other bees where to forage for food. Honey is the only natural food that does not spoil, as long as it is kept airtight. Australia is the only continent free of the Varroa destructor mite. 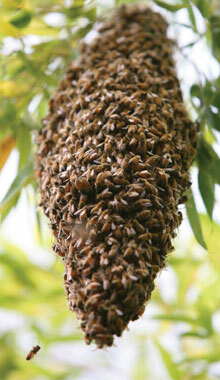 A healthy thriving hive can contain as many as 20,000 to 50,000 honeybees, most of which will be workers. The queen is the largest bee in the hive, easily identified by her elongated body. This form will help you to keep accurate records of your hive. A short guide to identifying honeybees, bumblebees, wasps/hornets and hoverflies. Become a member. Complete this form for year commencing 1st November 2018/2019. It is inevitable as a beekeeper or just being around bees that you will at sometime or another get stung! Please call Vicky Jones on 01905 423246 to check availability or to reserve equipment. Glossary of bee keeping terms for reference.